A dog's sweet, emotional response to being saved from a high-kill animal shelter has gained him thousands of fans online. Benny, an eight-month-old pit bull, had been abandoned last month and sent to Carson Animal Care Center, in Gardena, California - a high-kill shelter. For weeks it looked like the poor dog's fate was sealed until one day a family came in and fell in love with him. 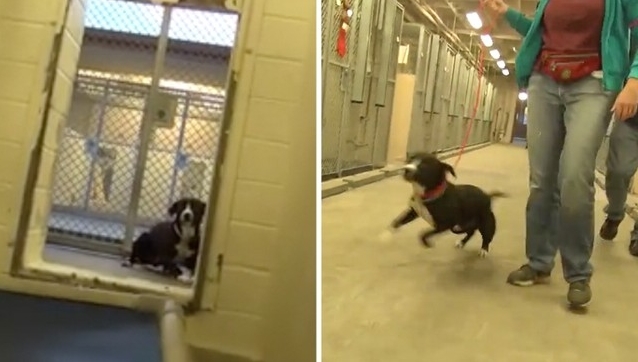 The pooch was finally adopted on December 10, just in time for Christmas, and when it came time to take him out of his cage at the shelter for the last time, his reaction was all caught on tape. The filming begins as a shelter worker approaches Benny's cage with a key. Confused and nervous, the black and white dog backs up through an opening at the back of his cage. Responses to "Pooch jumps for joy after realising he is being adopted from a shelter"